The US has raised concerns about the release of the Lockerbie bomber, after the foreign secretary said the decision to free him was "a mistake". William Hague spoke to US Secretary of State Hillary Clinton, who said Britain may wish to explain the circumstances behind Abdelbaset al-Megrahi's release. Four US senators believe oil giant BP lobbied for the move to secure a deal with Libya. The Scottish government said Megrahi was freed on compassionate grounds. It has denied having any contact with BP before its decision last year to release the Libyan intelligence officer convicted of the 1988 bombing which killed 270 people, most of them Americans. Special hearings examining Megrahi's release will be held at Capitol Hill on 29 July. The US Senate foreign relations committee said it would ask BP officials to testify after the company admitted lobbying the British government in 2007 over a prisoner transfer agreement (PTA) with Libya. BP confirmed it did press for a PTA because it was aware that a delay might have "negative consequences" for UK commercial interests. 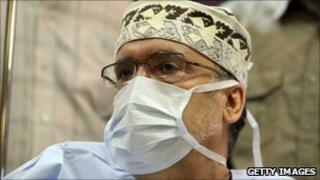 But the firm said it was not involved in any discussions regarding Megrahi's release. The bomber was released in August by Scottish Justice Minister Kenny MacAskill because he was suffering terminal prostate cancer and was said to have as little as three months to live. He had been sentenced to life imprisonment by a special Scottish court sitting in The Netherlands in 2001. The fact that he is still alive nearly a year after his release has provoked fury among groups representing the Lockerbie victims. Following the conversation between Mrs Clinton and Mr Hague, US State Department spokesman PJ Crowley said: "The secretary indicated that it might be appropriate for the British government to communicate with Congress as well to make sure that they fully understand what transpired a year ago." He later told the BBC: "There were very legitimate questions raised about the medical information that led to the decision. "People have raised questions about interactions between the UK government and BP over the negotiation of a prisoner transfer agreement. "And we will look to the British government to help us fully understand the basis to the decision that led to Megrahi's release." Foreign Office sources told the BBC Mr Hague reiterated the government's belief that the decision to release Megrahi was a mistake. He said both he and Prime Minister David Cameron had been opposed to the move, but that it had been a decision solely for the Scottish administration and that there was no connection between Megrahi's release and BP. A Scottish government spokesman has insisted that it acted independently. He said: "The Scottish government had no contact from BP in relation to Mr Al-Megrahi. "The issues being raised in the United States at present regarding BP refer to the Prisoner Transfer Agreement negotiated by the governments of the UK and Libya, and therefore have nothing to do with the decision on compassionate release which is a totally different process, based on entirely different criteria. "We were always totally opposed to the prisoner transfer agreement negotiated between the UK and Libyan governments. "The memorandum that led to the PTA was agreed without our knowledge and against our wishes."